There is nothing that quite ties a family together like a film night. A chance to shut the world away, squash together on the sofa and stop the bickering. Whether it’s watching a film that you have all seen time and time again. One that you are sharing with the children for the first time. Or even one that nobody has seen (sometimes the best option so nobody gives away any spoilers!). Halloween is a great time for spending some quality time together and building up fun traditions. From attending pumpkin patches together to find just the right pumpkin to carve and showcase outside your home ready for Trick or Treaters. To walking around your neighbourhood seeing the Halloween displays that your neighbours have created (and competed against to have ‘the best’ display). Once you’ve collected your Halloween candy haul, what better way to finish off the night with a Halloween family film night. A group of teens must escape from a massive labyrinth, survive a desert wasteland and break into the legendary Last City in this epic trilogy based on the Maze Runner book series. When his beloved grandfather leaves Jake clues to a mystery that spans different worlds and times, he finds a magical place known as Miss Peregrine’s Home for Peculiar Children. But the mystery and danger deepen as he gets to know the residents and learns about their special powers…and their powerful enemies. Percy Jackson: Sea of Monsters is the eagerly anticipated sequel to Percy Jackson and the Lightning Thief. It continues the adventures of Percy Jackson and his friends, as they look for the golden fleece, in order to save Camp Half-Blood’s magical borders from sinister foes. Based on the popular book franchise. In this modern fairy tale film directed by Tim Burton, Edward is a gentle, naive creation with razor-sharp scissors for hands. When he is taken home by a kindly Avon lady to live with her family, his adventure in the pastel paradise of Suburbia begins! Skip the squabbling, grab the popcorn and get ready for the ultimate Halloween which will have the seal of approval from the whole family. 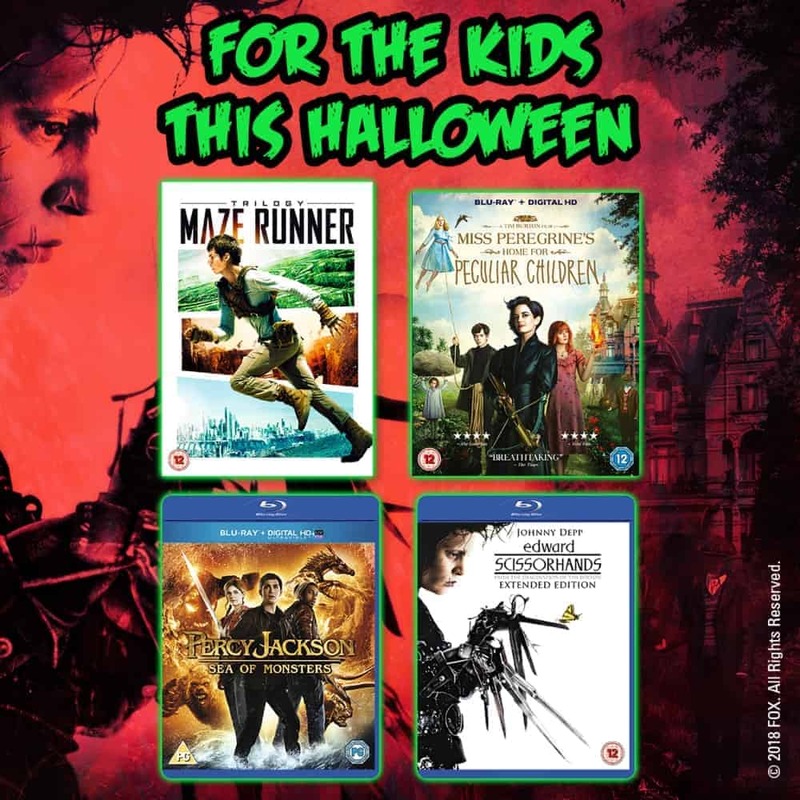 We have a monster mash of titles up for grabs, with one lucky winner receiving copies of Maze Runner Trilogy, Miss Peregrine’s Home for Peculiar Children, Percy Jackson: Sea of Monsters and Edward Scissorhands. Miss Peregrine’s Home for Peculiar Children, sounds like an intriguing and eye catching film! The Maze Runner Trilogy… always one I wanted to get around to watching. I would definantly watch Edward Scissorhands first. Got to introduce my boys to the retro films first! I’d watch The Maze Runner Trilogy first. Edward Scissorhands – such a classic! Edward Scissorhands, it’s been years since I last saw it, and it’s such a brilliant film! We’d watch Edward Scissorhands first even though it always makes me cry! Definitely Miss Peregrine as I completely missed it at the cinema! Miss Peregrine’s Home for Peculiar Children – I haven’t manqaged to see it before and it does sound very good. Edward Scissorhands an all time favourite in our house . Percy Jackson: Sea of Monsters – absolutely love Percy Jackson! Miss Peregrine’s Home for Peculiar Children would be the one I would watch first, I’ve read the book and I loved it but I have never seen the film. I’d watch Miss Peregrine’s Home for Peculiar Children first, it’s a fab film! Edward Scissorhands I havent seen that in years so will be good. Edward Scissorhands for the nostalgia!! Miss Peregrine’s Home for Peculiar Children. I’ve read the trilogy but not seen the film yet! Me and my family would watch Edward Scissorhands first! Edward Scissorhands. I don’t think i’ve seen that since childhood, i remember it being good though. Miss Peregrine’s Home for Peculiar Children as it’s such an amazing film. I really love it! The Maze Runner Trilogy, I’ve wanted to see this for ages! Will definitely be the maze runner trilogy! Edward Scissorhands – haven’t seen it since I was a teenager on sleepovers! I will watch Miss Peregrine’s Home for Peculiar Children first. Maze Runner Trilogy, has I have not seen that last one yet. Miss Peregrine’s Home for Peculiar Children is a brilliant film title which makes me want to watch it. Edward scissorhands my kids have never seen it before. Edward Scissorhands….what a classic! Johnny Depp is oh so young in it too! I’d watch Edward Scissorhands first. Edward Scissorhands. I haven’t seen it for years. The maze runner, saw little bit of this, would love to watch it all. The Maze Runner Trilogy as only seen the 1st two! The Maze Runner Trilogy as I’ve read the books but nit seen the films. We’d watch Miss Peregrine’s Home for Peculiar Children, I think my daughter would love it. We would watch Percy Jackson: Sea of Monsters first. Thank you! Maze Runner Trilogy – We’ve only seen the first film, so it would great to see the other 2 as well.